Burglars have stolen laptop computers containing the payroll details of half of the Metropolitan Police staff, Scotland Yard has said. The computers were taken in a raid last Thursday on offices used by the firm responsible for the Met's pay and pension services. The three laptops contained details of the Metropolitan Police payroll. One man has been arrested and bailed in connection with the burglary, in Southwark, south-east London. Scotland Yard said the burglary took place last Thursday evening and the alarm was raised when staff arrived for work the following day. The raided premises is used by LogicaCMG, which runs the Met's pay and pension services. 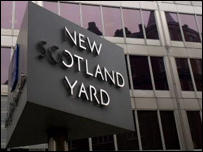 A Scotland Yard spokesman said there was "minimal" risk of the staff involved falling victim to fraud or identity theft. He added the Met was in discussion with UK fraud prevention service CIFAS, UK payments trade association APACS, and credit reference agencies about further action to prevent staff from becoming victims of fraud. The raid is being investigated by Burglary Squad officers supported by the Specialist Crime Directorate. One man was arrested on suspicion of burglary last Friday. He was taken to a south London police station and interviewed before being bailed to return at a later date, pending further enquiries.